The Local Rules require CM/ECF users to maintain current and accurate contact information in their CM/ECF System account. See Local Rule 5-4.8.1. CM/ECF users must log in to CM/ECF and update their account whenever this information changes. (Instructions for updating your account are provided below.) Attorneys practicing before the Court, as well as pro se litigants with pending cases, should complete such updates within 5 days of any change in personal contact information. See Local Rule 83-2.4. In addition, if you have pending cases, you must also file and serve notice of any change in contact information within 5 days of the change in each pending case. To do this, use Form G-06 (“Notice of Change of Attorney Business or Contact Information"). When filing that form electronically, use the Civil/Criminal Change of Attorney Information filing event, which appears under the Notices events category. If you are a registered CM/ECF user, you must log in to your CM/ECF account and update your information in the CM/ECF System to ensure that Notices of Electronic Filing are sent to the correct address. See Local Rule 5-4.8.1. To access your individual attorney record, use the CM/ECF Toolbar - Utilities option. Once the Utilities option is open, click on the 1. Maintain Your Address, 2. Maintain Your E-mail Address, or 3. Maintain Your Login/Password option. After making any updates to your CM/ECF account, be sure to click "Submit" or your transaction will not be completed. Click the Submit button to submit the modifications and/or additions made. ​"Configuration options" and "Case-specific options" are presented when you click on a primary or secondary e-mail address. Under "Configuration options," primary and secondary e-mail addresses are automatically set to receive notices, and that setting should not be changed. If an attorney does not want a particular secondary e-mail address to receive notices, he or she should remove that secondary e-mail address, instead of changing the setting under the "Configuration options." An e-mail address that has been designated not to receive notices will be removed by Court staff. Under "Configuration options," you may choose to receive a separate notice for every filing or a daily summary report of filings in all cases for which that e-mail recipient has been designated. You may also choose the format of notices (HTML or text) and whether the e-mail recipient will receive general announcement notices from the Court (recommended). "Case-specific options" permits attorneys to add cases for which they are not counsel of record but in which they would like to receive notices of electronic filing. It permits attorneys to remove any such cases when they no longer wish to receive notices. "Case-specific options" also permits attorneys to select cases in which they would like notices to be sent using a different delivery method (i.e., per filing or a summary report) than the one designated for all cases. Click the Submit button to submit any modifications and/or additions made. To add an address, click on “add new e-mail address"; enter the address; respond to questions under "Configuration Options." To remove an address, click on the secondary e-mail address you wish to remove; delete the address in the “Configuration Options” window. Click on “Submit all changes”; if there is another submit page, click that as well. Do not use the back button or changes will not take effect. Do not duplicate a primary e-mail address as a secondary e-mail address. Remember to click the Submit button to submit any modifications and/or additions made. NOTE: After successfully updating the 1. Maintain Your Address or 2. Maintain Your E-mail Address options, the system presents the Select Cases To Be Updated screen. The attorney should select the cases in which the update is to be applied. The changes made by the attorney will be recorded only in the cases selected. Use caution when selecting “Update all”: you will receive notices of electronic filing at your updated address for all cases in which you have not been terminated, even if you are no longer actively involved with the case. Click the Submit button to submit your updates in the selected cases. 3. The "Maintain Your Login/Password" option permits attorneys to update their login and password information. DO NOT change your CM login to match your PACER login. Doing so will result in loss of ECF access. Record the changes made for your reference, then click the Submit button to submit the modifications made to the attorney’s individual login/password. Note: If you change your password, the Help Desk can reset it to a new password, but they cannot recover the password you created. For additional information regarding maintaining your CM/ECF account, visit the e-filing section of the Court's website. For answers to common questions, visit CM/ECF Frequently Asked Questions. More answers may be found on the PACER website. 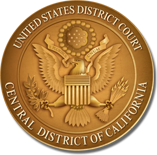 Please send e-filing questions not addressed in the FAQs to: ecf-helpdesk@cacd.uscourts.gov or contact the ECF Help Desk at (213) 894-0242, during normal Court business hours.